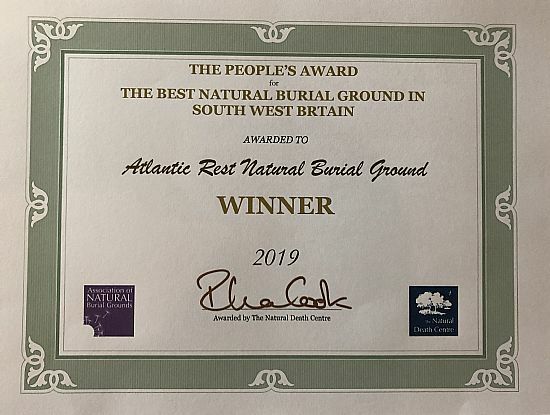 Atlantic Rest Natural Burial | Proud to be winner's of the South West People's Award! Proud to be winner's of the South West People's Award! On Saturday 23rd March Tom and I attended an ANBG meeting up in Hereford. This was hosted by a very lovely member site Humber Woodland of Remembrance. It is the time of year that the People's Award is recognised by region with a winner and runner-up. Back in 2016 we were very proud to have won the runner-up award. This time we are even prouder to have been winner of the award for 2019. These awards are based on the feedback of the families who have used Penlow to bury their loved ones or inter their ashes. We are so grateful to everyone who takes the time to fill in the feedback forms. A massive thank you!